MartyCube... Lets get ready to CRANK THE BASS!!!!!!!! I know for a fact this is due to the open concept nature of the house. My old room had walls that the 8" woofer in my LSi 15's were decent close to, and the room wasn't nearly as open as this one. In addition my old room was narrower and longer than this room (more of the perfect rectangle shape). As a result my low end gets sucked out of the room in the house. I have been very intrigued by passive subs here the last few years, and was somewhat set on Chase Home Theater 18" subs (now Chane Music Cinema), until I stumbled across a couple build threads on AVSForum for something called a "MartySub". It utilizes a low cost 18" Dayton woofer paired with a Beyerdynamic iNuke amp (most use the 3000 bridged or the 6000 if going with duals). 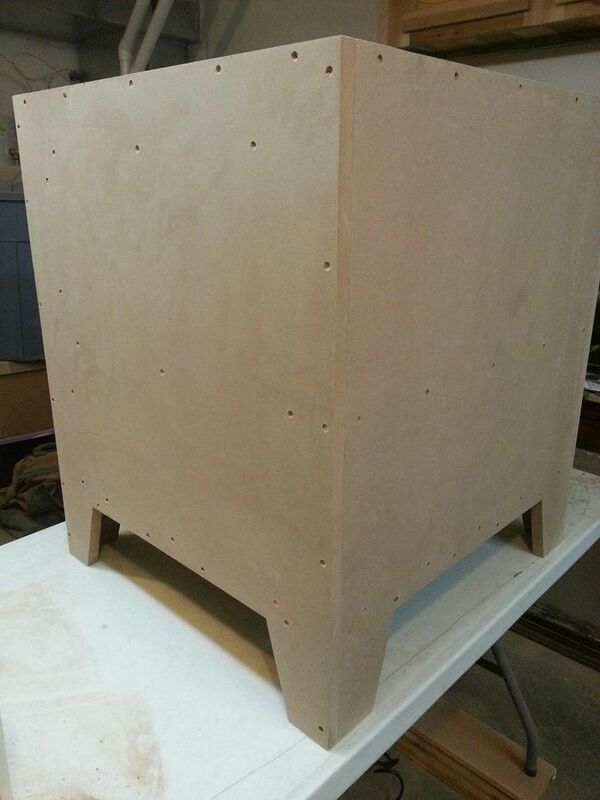 Total build cost is around 600 (when using the iNuke 3000) after you factor in MDF and parts. There are folks on AVSForum selling pre-made kits for the box, but they range in price from 200 USD and up (search FlatPacks if your interested). Their are a couple variants of these subs depending on what size you want to build. I am interested in the Martycube as its got a footprint thats more likely to pass the WAF factor. In addition the finish most folks are using is Rhinoliner which is the same finish on my Elemental Designs A2-300 sub. My current sub is 18" x 18" x 21". So this sub will be a bit bigger than my current one but not by much . After looking hard at my budget and goals I made a couple decisions.... the iNuke was just something I wasnt ready for, and pro-amps in general. For use with a passive sub they do exactly what they need to, but I just didnt like the way the iNuke looked, and something with similar power from Crown or QSC were either too expensive, or still required me to modify them to have a quieter fan (and void the warranty). So I ended up finding a Dayton SA1000 amp used on Audiogon (thanks RYAN!) for what I considered a decent cost. In addition while the Dayton 18" driver wasn't SUPER expensive... well I am cheap. I discovered that the Stereo Integrity D2 & D4 woofers were VERY close in spec to the Dayton, and both were on closeout prices. Since I wanted a nominal 4 ohm load, I contacted Stereo Integrity if they had any leftover D2's (D2 = Dual 2 ohm, D4 = Dual 4 ohm) since their website showed them out of stock. I got lucky and they had some B-Stock D2's which were not ever used and returned, simply had some small cosmetic defects so they didn't sell them. I was able to acquire one of these woofers, NIB for lower cost than the D4's and compared to the Dayton 18" driver saved quite a bit. I want my sub to be able to be used either downfiring (normal use) or front firing (when I want to show off the sub's excursion or just show off). I am not sure if I will use removable legs, or just make the legs so that they hold the grill in place when front firing. If I go with a grill, I may look at a metal grill option so again the kido cant poke through it. I have a contact that would be able to powdercoat the grill for me flat black pretty quickly and at a low cost, so that would look pretty cool. I also plan to have the edges rounded everywhere so if Skye knocks into it she wont crack her head on a sharp edge. With a 1 year old I want to lower the probability of her poking her finger into the driver, or putting toys in the ports. With how these ports are configured it wouldn't be a problem since the port is on the bottom and then goes vertical all the way in the back. My existing A2-300 is downfiring but its got a port on the front that goes halfway into the box and then drops down so I have to keep watching to make sure she hasn't put a toy in it. With a dual configuration like I am thinking about I am trying to determine the best way to camouflage the binding posts. I am thinking I may just add a false back panel to the part thats the top (when downfiring) and the back (when frontfiring) that gives me enough of a gap to put in the speaker wire with connectors in either configuration but keeps the illusion of a rectangle/box. The last item I bought was a 2x4 MiniDSP & UMIK-1 USB mic. This is a product many of us should be more familiar with. The USB mic is used in conjunction with a program called REW to run frequency sweeps to graphs your in room response. The MiniDSP is basically a flexible programable DSP. What does this mean to you? And why is it important? It means that you can use REW to measure your room response and create filters to even out your dips and peaks. The MiniDSP can then take those filters and apply them to your existing connection. So you have the ability to tweak the EQ to your liking (see thread). You can also boost response down low. This is VERY important to me because my current receiver (Integra DTR 5.9) doesn't have the ability to EQ the sub. It just has 2EQ. 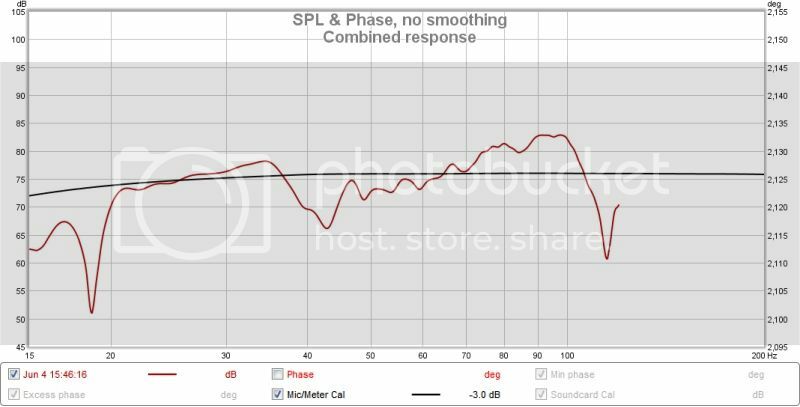 And the receiver I am buying next year (a Pioneer SC model) as of now doesnt EQ anything below 63hz. The ONLY downfall to the MiniDSP is that your taking the analog signal and converting it to Digital to apply your EQ, then back to analog. So your adding an additional conversion. In addition the MiniDSP is limited in what it can handle bitrate wise. In my case since this is JUST for a sub and HT system, those were compromises I was ok with. So if anyone is looking to build themselves a low cost sub with LOTS of potential... take a look down this road, it might save you some time and money. I have the Dayton in my possession (no pics sorry), and took delivery of the rest of the parts for the build today. I am probably going to do this sometime in June as my local contact is pretty busy right now, and I dont need this done "right" away. Below are some pics of the 15" driver and the miniDSP. Double Boxed & to boot surrounded by a custom fit styrofoam casing. This I like! 1. This thing is FRIGGIN HEAVY! Its got to weigh at least 30 lbs by itself! 2. This thing is FRIGGIN HUGE!. You dont really realize how big a 15" woofer is until you actually have it in your hands. 3. Build quality looks phenomenal. I cant wait to get it home to get some more light on it. Sweet man. I know you've been looking forward to this. very nice getting jealous. It could also work as a way to sooth the small one asleep you know instead of "rocking"
Still trying to resist the temptation to build a couple of my own (THANKS DAN). I'm telling you, for the price, buy a driver now, heck buy 2, they wont be around too much longer. If you dont end up needing them, I bet you they will sell and with the factory boxes shipping wont be a big issue (besides cost). DAMN I WISH I HAD WOOD FLOORS DOWNSTAIRS. This is gonna be FUN!!!!!!!!!!!!!! Awesome fun, EnderShadow! Wavy floors, and shaking windows! 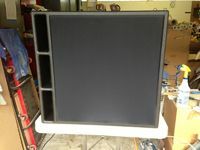 I'm ordering a 4 cu ft. flatpack from DIY soundgroup , a Dayton Audio Ultimax 12" to be run @ 1000watts per vc with my 60 lb Peavey Cinemacoustic amp. f3 of 19hz. homebuilt is where it's at in subs. Home Theater- 5.1/DTS bliss-- Source: Sony BDP-S790; Pre/Pro: Golden Theater GTX-1; Amplifiers: Golden Theater GTA-1; Speakers: Main: RTi6's, Center: RTi6's, Surround: RTi12's, Sub: KSW-12Video: RCA Scenium rear projection 52" @ 1080i. If your a WinISD guy, HomeTheaterShack has the file for measurements.. I considered the SI subs. My situation requires a fairly small solution. 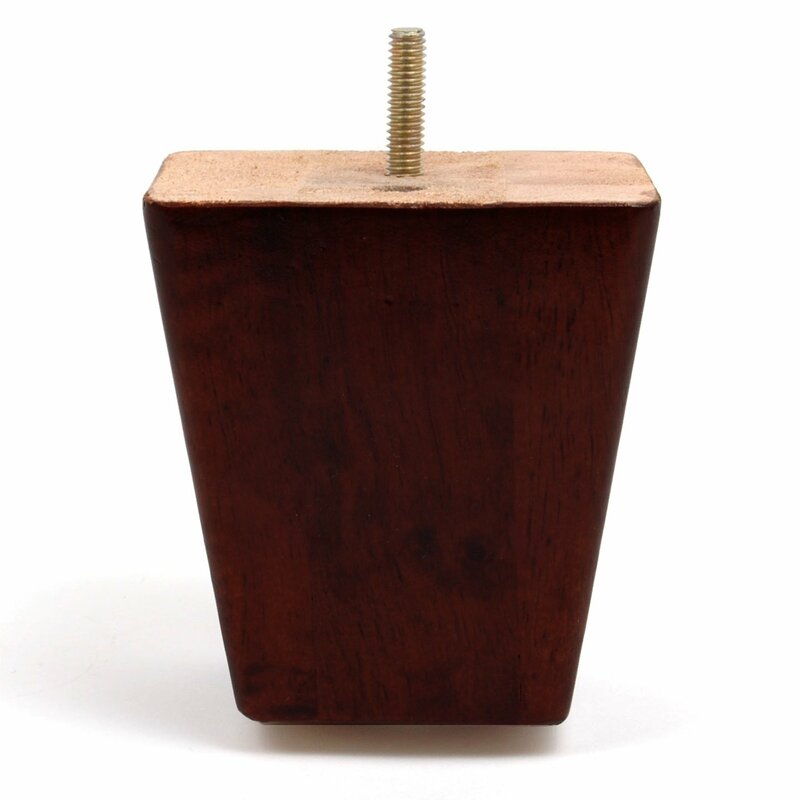 Also, the flatpack I want is only for a 12" Dayton. It does have 2 18" X 3" ports to achieve 19hz tuning. I will also have to use a 20hz filter, as the Ultimax is rated at 600 watts both voicecoils. Running in 2ohms will create a bit of excessive [email protected] 1000 wpc. Or I may go the route you chose, DSP. This setup allows me the flexibility to add an additional identical sub (if needed) and a much more stable 4 ohm per channel at 700 wpc. Total cost (including amp) will be about 500 for the one, and around 400 for an additional unit. Just out of curiosity, why aren't you going sealed? 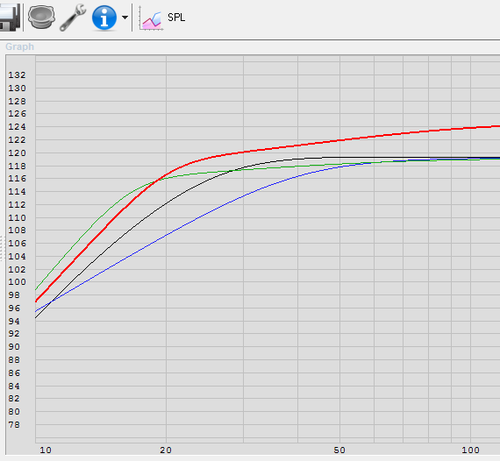 You can easily boost that with the DSP down to 19hz, it'll be a lot more in phase/punchier. Switching over to non-audio considerations: Smaller box/higher WAF plus no ports for the kids to **** in. So slightly off topic, but not, I had a LITTLE bit of time today to play with my MiniDSP and UMIK-1 mic and REW. I already know I am going to have some issues until I get my DIY sub built. The Crossover frequencies are a bit messed up but here are the best two graphs I have. Here is how I obtained the EQ for this system. 1. Connect the LFE to Input 1 on the MiniDSP. 2. Connect sub LFE to Output 1 on MiniDSP. 15. Run EQ again for entire system with Audyssey engaged. Also keep in mind 2EQ doesnt apply any filters to the sub at all, so I can leave Audyssey on when EQ'ing the sub as it has no effect. Other Audyssey EQ's are different and require additional steps.. So here are my initial results. Any other crossover than 40hz resulted in a larger canyon between 40 hz and whatever crossover I set. I moved my sub over a bit and it did not clear up the issue. Well I played with things a bit more and here is what I got. First graph is subs and mains as their own graphs. 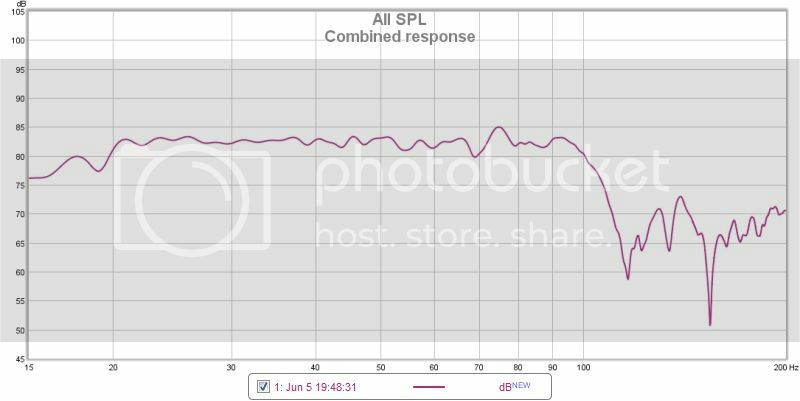 Please note this is AFTER applying EQ to the sub channel. Ok, so the more I play with this the better I get things. Here is the system after today's playtime. The ONLY concern I have is that my sub is at 100% gain so I cant go any higher really. However that said, in order to deal with the really weird dip I had to kill some of the low end displacement so I know there is more that I am simply not using due to EQ. Here is the combined response. Any ideas on if the MASSIVE drop over 100hz is a big deal or not? Man how did I miss this post previously? Anyway cool to see you got the project underway.... Looks look you are dialing it in. Not sure what the dip at 100Hz is? 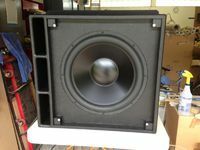 The larger 18" in a sealed enclosure is smooth out to 400Hz. I'm sure you are crossing over lower than that so....non-issue. Looks like chalugadp might be offering veneer options. I might have to join the Marycube club? The 100hz drop is in your mains, not the sub. I would look at placement, phase issues, polarity etc. of your mains. How much are you moving the mic around when taking these measures? Room modes can give you those dips (which can be confounded with placement), so it's worth seeing what's happening 3-4 feet over from the listening positioning. Don't lose sight of just listening to see how it sounds: you can go nuts trying to tweak out these random dips. Yeah, all measurements taken from my main LP. So after selling off a couple items it looks like I can go ahead with this build. My buddy and my schedules just are having too much trouble lining up. So an update and then a question. In the interim I discovered a company making a FlatPack Martycube type design that is basically the same as what I was wanting. I confirmed with the owner that these enclosures are basically a MartyCube in a slightly different configuration. Its cheaper than the AVS Flatpack by quite a bit. So this is the enclosure I will be going with. I'm going to try and find a local contact who can round ALL the edges rather than just the front ones. The same company has sealed enclosures which I may use for the Kappas that a buddy gave me, but thats a later on kinda project. So now to my question. @ZLTFUL‌ suggested that I DONT make the sub downfiring, thinking because I was on carpet on a slab that by having the sub and port downfiring it would sound muddy and bad. I'd love some thoughts on this. I would not go down firing with that particular box design. You can round the edges yourself...just some elbow grease is needed. For the reasons mentioned above? I ask because if I dont go downfiring, I need to buy/build a grill so my daughter doesnt poke the woofer. I'd also want to do something to install some spikes on the sub like my Elemental Designs sub has. Why not go sealed down firing? PSA does it with their 15" sub with great results. Your DSP should make it sound sweet. The output when sealed is greatly reduced on this woofer. There is around a 5db difference from 35 hz down to 20hz where the even out. I'd be open to looking at a sealed option, I just know that ported has more output which is what I am looking for. It also normally requires a fair amount of power and this sub can only handle 600 watts mechanically so its not a great sub to overpower. I really need to get you over to the house Cody...**Disclaimer** Not responsible for detached retinas. So I bought the enclosure today and contacted a local shop to see the price to have them custom build me some 4" legs and route all the edges after I build the enclosure so it all looks the same. Entire sub will be painted in duratex to have a similar look to my eD A2-300. Lol, I'm willing to take the damage! As a update to this thread... my local contact said they would gladly router the edges for me free of charge and help me attach legs to the enclosure. That said she isnt sure if they can make the legs for me as they have some health stuff going on that keeps her off the lathe. I might have someone else that can throw together a set of legs for me now that I think about it..
Not sure how much you are looking to spend... but how about the SVS SoundPath Isolation feet?